It's Muffin Tin Monday, and the theme is numbers. So what did I think about? The Very Hungry Caterpillar, with his one apple, two plums, etc. We decided to use a selection of the foods from the story, but to change up the numbers. Pierce has been counting for a while now, so I figured I might as well challenge his thinking some. He had 6 slices of apple, one slice of Swiss cheese (with 2 holes), 5 pickle slices, 7 slices of sausage (technically hot dog - but we adapted it to fit the story), one cupcake (not given until after lunch) and one big slice of plum (technically a pluot - but close enough). It went over quite well. I am doing a giveaway that includes a holiday MUFFIN TIN (and a holidays cookbook)! Click HERE to enter. The cupcake would go first at my house. 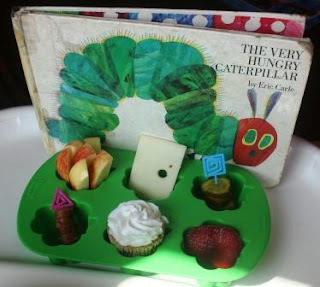 This is one of our favorite books, awesome job recreating it for MTM, looks delish! I love that you paired a GREAT book with this weeks theme!!! How perfect!!!! What a great tin! My boys love that book and it's actually our book for next week. Our tin will be based on it! Mind if I use some of your ideas?! yummy - love that book! Love this. Where did you get this baking tin? is it mini sized?